The Australian Army Nursing Service, which was actually a reserve, was established on 1 July 1903. The Service was staffed by volunteer civilian nurses who would be available for duty during times of national emergency. Members of the Service served in both the World Wars, staffing medical facilities in Australia and overseas. In 1949 the Service became part of the Australian Regular Army and is now known as the Royal Australian Army Nursing Corps (RAANC). Prior to Australia's Federation in 1901, each colony controlled its own defence force, of which the nursing services formed a part. In July 1903 the nursing services of each colony joined together to form the Australian Army Nursing Service. The Service which was part of the Australian Army Medical Corps was made up of volunteer trained nurses who were willing to serve in times of a national emergency At the outbreak of World War I staff were recruited from both the nursing service and the civilian workforce. They served at field and base hospitals in Australia as well as in Egypt, Lemnos, England, France, Belgium, Greece, Salonika, Palestine, Mesopotamia and India. Acccording to the Australian Department of Defence, 2,562 AANS nurses joined active service during World War I, with 423 of these women serving in Australia..Another 130 with the Queen Alexandra Imperial Nursing Service. 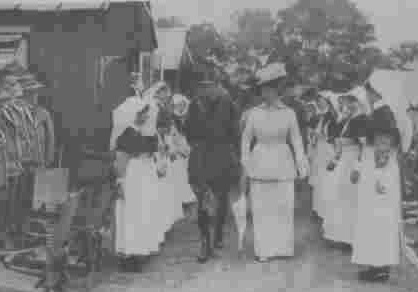 The Queen visits Australian Nurses in France WW1. Mother ANZAC, but who was she? She drank her scotch straight, ("scotch is for drinking, not bathing in" she would say), she did her talking the same way, played poker to beat the boys and ran ballroom functions in Brisbane that were attended by the high and mighty. She grew up in gold mining towns, was widowed in 1891 with 3 little kids to raise but in the great flood of 1893 she climbed into a boat and went to rescue stranded families. She did a tour of duty with the AIF after enlisting at age 57 (she 'forgot' 10 years of her age on her papers) and she signed up for another. She worked with the Maoris in NZ after she contracted diabetes, was buried with full Maori tribal honours and along the way she revolutionised the AIF attitude to massage (now called physiotherapy). They called her Mother ANZAC but who was she ? 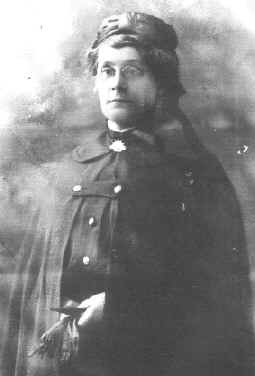 She was Staff Nurse Esther Barnett. She he enlisted on August 18, 1915 when the terrible cost of Gallipoli was starting to be realised. Born 1857, she was 57 when she enlisted but she 'forgot' a few years. 3 days after enlisting the qualified masseuse who had worked in London hospitals, was on her way. She and the other 17 male and female practitioners of the art of medical massage were on their way to Egypt. They worked on up to 40 cases per day in a field that was only just starting to be recognised by military authorities. Many patients, particularly shell shocked ones in total or near total paralysis responded well and quickly. Shell shock was likened by many to fear or cowardice but is now recognised as PTSD. She came home in 1917 and worked with the Matron at the 6th Australian General Hospital but duty called and she returned overseas in June of 1918. Illness stopped her getting there and she disembarked in Wellington NZ. After release from hospital she worked amongst the Maori tribes until her death in 1921. Nurses who died in WW1. It is reported that 25 Nurses died serving overseas. Military Medal awards to AANS Nurses in WW1. The first bravery awards for Australian women were given to four nurses. On the 22nd July 1917 four members of the AANS, Sisters Caywood, Deacon, Ross-King and Staff Nurse Derrer were awarded Military Medals (MM) for rescuing patients in burning Casualty Clearing Stations. Other Australian nurses to be awarded Military Medal during World War I were Sisters, Pearl Corkhill and Mary Kelly. "I've been a soldier now for nearly three years, and please God I will go right to the end ... if anything happened, and I too passed out, well, there would be no finer way, and no way in which I would be happier, than to lay down ones life for the men who have given everything." She died five months later, in May 1918. "We look forward to our letters on mail day. Of course we can never make our letters sound as cheerful as yours. I am sure you will understand why when I tell you that we are surrounded by sadness and sorrow all the time ... do you know, Muriel, that as many as 72 operations have been performed in one day in our hospital alone ... you could not imagine how dirty the poor beggars are, never able to get a wash, mud and dirt ground in and nearly all of them alive with vermin. They feel ashamed being so dirty, we always tell them that if they came down any cleaner we would not think they had been in it at all. A group of Australian nurses sailed for France in 1916, organised by the Australian Red Cross and financed by the Australian Jockey Club. Their blue uniforms were made by department store David Jones, hence their name The Bluebirds. They were, they said, "gifts to France". The AANS returned to a reserve status. The Australian Army Nursing Service was one of only two women's services (the other being Voluntary Aid Detachments) that were active at the outbreak of war in 1939. Initially the enlisted nurses were the only females to serve outside Australia. Members served in England, Egypt, Palestine, Libya, Greece, Syria, Ceylon, Malaya, Singapore, Papua New Guinea, Solomon Island as well as throughout Australia. They served in hospital ships, troop transports, base and camp hospitals and some spent time in Prisoner of War camps. After the war members served as part of the British Commonwealth Occupation Force in Japan. In July 1947 members of the Australian Army Nursing Service were transferred to the Interim Army, and in November 1948 the Service was designated a 'Royal' one. In July 1949 the Royal Australian Army Nursing Service became part of the Australian Regular Army. In February 1951 the Service became a Corps and is known as the Royal Australian Army Nursing Corps (RAANC). The pledge made by AANS nurses. I pledge myself loyally to serve my King and Countryand to maintain the honour and efficiencyof the Australian Army Nursing Service.I will do all in my power to alleviate the suffering of the sick and wounded, sparing no effort to bring them comfort of body and peace of mind. I will work in unity and comradeship with my fellow nurses. I will be ready to give assistance to those in need of my help, and will abstain from any action which may bring sorrow and suffering to others. At all times I will endeavour to uphold the highest traditions of Womanhood and of the Profession of which I am Part.